Having a blemish and and acne free face is quite hard to achieve for some while for others find difficulty maintaining a flawless face. Since the trend now equates beauty from having a good skin, a lot feel obligated to maintain a smooth skin especially on the face. What’s the first thing that comes to your mind when you see a pimple on your face when you wake up in the morning? Of course, you would pop it to get rid of it in no time. 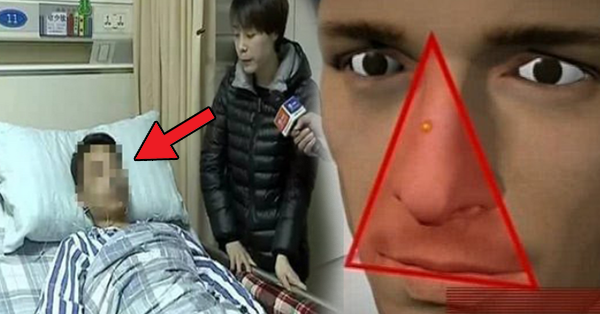 Usually, the concequence of popping a pimple is leaving an acne mark or a small scar on the skin but not for this man in China. A 50-year-old man from Zhejiang, China almost costed his life for just popping a pimple on his upper lip. As he mentioned, the pimple grew in size and caused great pain in the area where it grew that’d why as a quick remedy, he decided to just pop it without any experts consultation. After popping it, he thought that his problem was over but he was wrong. The affected area turned black and along with the physical effect, he experienced higj fever and difficulty in breathing. With the unforeseen complication, the man rushed to the hospital where he underwent surgery to remove about 8-centimeter dead tissue and extracted up to 100 ml of pus from his wound. According to the attending physicians, the man necrosis or production of dead tissue due to infection or toxin and later developed sepsis, condition where the body responds from infection causing some vital organs and tissues to shutdown. Fortunately, the man was saved but will live for the rest of his life with a deformed face or until he undergoes cosmetic surgery to reconstruct his face. Meanwhile, watch this video made by GMA news, 24 Oras about the danger of popping up a pimple in this area of face. You can also read: After She Died, People Couldn’t Carry Her Coffin, Later They Discovered Something!